GREAT thanks to Ignatius Layola. It played a major role in improving my skills in English. Especially in speaking, there were lots of practice questions and tests which are in the same kind of TOEFL speaking questions. It helped me to get familiar with the pattern. After practicing those questions I was able to face all the speaking questions without any anxiety. You can find plenty of resources for TOEFL courses, but it is tough to find efficient TOEFL resources like at Ignatius Layola. I am glad that I found them before taking my TOEFL exam. In addition, I also got a scholarship in Swinburne University, Melbourne from Ignatius Layola and a good 99/120 score on my first TOEFL test. Thanks for improving my English skill. In mid February this year, my friend and I went to Layola course centre near Grand City, Surabaya. Upon arrival, Mam Suryani welcomed and greeted us nicely. She explained us about overseas education pathways to my friends. Hearing that, I was directly interested and asked Mam Suryani further information about the programme. She explained to me clearly and just a few moments I decided to take the program. I applied to the college exactly one week before the course commenced. One week is a very short time to apply for college, because most of my friends have applied several months prior to the course . Mam Suryani and Ko Gunawan worked really hard to assist me ,including the application processing and student pass for my college. Luckily within a week, I was accepted in the course , awarded scholarship bursary and got my visa approval. I was so lucky that I was just late one day for my study. Now I am studying in college, I know it would not have happened if I had not met Mam Suryani. So, when you are still confused about your education, visit Mam Suryani at her office for consultation. She will help you to get into your desire school at totally no cost, not even parking fees. Ignatius Layola really helped me throughout all my preparations for TOEFL. At first, I never thought I would be able to get a good TOEFL score since my English wasn’t that good. However, I improved my English here in Layola taught by mam Suryani patiently until I can get 105 which is beyond my expectation. I’m really grateful that I chose the right place to study and prepare everything for my Uni life. Thank you so much mam Suryani and Ko Gun. Ignatius Layola helps me with a lot of things, from the registration until I got accepted at PSB Singapore. At first I don’t know what to do, but mam Suryani helps me with explaining about studying at Singapore, about the major, the lifestyle, and any other things, this make me really interested in studying at Singapore, the process is really easy with the helps from Ignatius Layola. Thank You very much Ignatius Layola !! After joining Layola for almost 1 years, since kindergarten up to graduating High School. My English was taught perfectly by Mam Suryani. I would like to say thank you to Mam Suryani for teaching me English from a little boy until I become teenager. Mam Suryani did not only help me with English but she also help me to enter my dream university UNSW. From beginners, teenagers, and adults learning English in Layola will really help you a lot in improving grammar, listening, reading, and writing. I deeply encourage all of you to join Layola. Thank you mam Suryani for all your teachings and support. For me, Ignatius Layola helped me a lot to increase my TOEFL score. I only prepared myself for one month since there was a limitation of time required by the university I applied to. Thankfully, all the drills given to me 3 times a week by the understanding teachers made me able to accomplish good results. The place is also cozy and feels homey that I didn’t feel frigid. Also, the teachers are informative and are always ready to manage all affairs faced. Thanks to Mam Suryani, Ko Daniel and Ko Gun. I am very grateful to have made it into Curtin University Singapore. Layola has given outstanding service by processed all important things for my study at Singapore. Besides, I also take TOEFL preparation course at layola and with the support and teaching from mam Suryani I passed the TOEFL test with a good score. Thank You layola for giving the opportunity and help me to achieve my dream. Joining classes at Layola helped me achieve my desired TOEFL score in such limited time. The confidence I have now is only because of your training. Also, I must say that I really appreciate the teachers’ expertise here at Layola. 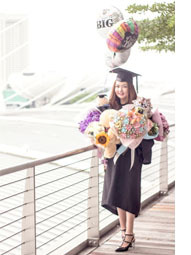 Their sincerity, devotion, and dedicated efforts have given me the support and assistance to enter and complete my Bachelor’s degree in JCU Singapore. Couldn’t have done it without you. Thank you! I’m Alberto Tandya from SMAK St. Louis 1, Surabaya has already known Ignatius Layola since 2013 when my cousin is going to continue his study to Singapore. Because I want to continue my study at James Cook University Singapore, hence I decided to trust my preparation for my next study to Ignatius Layola. I regret nothing from my decision, because Ignatius Layola guide me carefully and helped my registration at JCU Singapore. I’m really glad because Ignatius Layola willing to take me as one of their student. Not only the administrative problems, Ignatius Layola, especially Ma’am Suryani, really cares with all of her students. Ma’am Suryani helps me find a place to stay, and also she cares for my health and my grades. 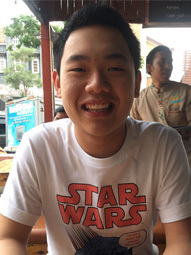 Hello everyone, my name is Richard Honami Hadi Putra, I was graduated from James Cook University Singapore majoring in International business and Entrepreneurship management, and currently studying in Central Queensland University Melbourne majoring in Master of Business Administration. Basically, Ignatius Layola was helping me a lot with my study overseas by teaching the correct English and help me to decide the best university for me. I'm proud of saying that I'm very happy to meet Mam suryani and Ko Gun! Because Mam Suryani and Ko Gun always help me not only in my academic progress but also support me like my parents. Ignatius layola has helped me a lot through my application and enrolment from my first degree until today, my master degree in Australia. They always concern on every student future, they want the best for us, thus they helped me on choosing the right as well as best university and major that suit with my dream well. Other than that, They give the best service for us as their student, no other can give as best as they can, since ma'am Suryani always takes us like her own child and always believe in us. Ma'am Suryani taught me english patiently from zero until i can speak and write very fluent like now. Who I am today, what I achieved, and all goals that completed, are all because of Ignatius Layola. No words can explain how great-full, bless-full, and deeply thankful I am on every help and support that I get until today from Ignatius Layola. Thank you so much. First and foremost, I would like to thank Layola for helping me in undertaking the TOEFL test. At first I was afraid of the test because I had a very little time to prepare. However, Layola had given me the chance to optimize that short period of time. The schedule of the course was really flexible that I was surprised. The staffs and teachers were also very supportive and attentive. The lessons were easy to understand and follow. In addition, the fact that I was going to take the TOEFL test on that very same room and using that very same equipments gave me enough opportunities to be used to them, which helped me a lot in overcoming my nerve during the test. As a result, in just two weeks of preparation, I managed to not only achieve my goal, but also got 115 for my TOEFL Test. Thank you Layola! Layola has been supportive and responsive from the moment I was looking for a university until I made it into 4th semester in James Cook University. Layola always invite me to the conferences, encourage me to showcase my talents and help me achieving my goals. Furthermore, Mam Suryani has given me guidance about all the difficulties that I faced regarding my studies. Thank you Layola for being helpful and giving me the opportunity to be at where I am now, 8 months to graduating my bachelor degree. I am glad to have chosen LAYOLA SURABAYA for helping me with my admission for my postgraduate studies at PSB Academy, Singapore and also LAYOLA had provided me tremendous information about studying and living in Singapore. The counselors also have quick response to answer my questions and willing to help me from A to Z. They make processes that are supposedly complicated easy and fast. Thanks LAYOLA! My experience at Ignatius Layola has been really wonderfull. I am so thankful to ma'am Suryani and ko Gun who have helped me in various ways. Not only did they teach me what I needed but they also evaluated my skill precisely. All of those make me improve and overcome my weaknesses. Layola has given me the important materials and thorough teachings. The teachers really encouraged me even though I was not confident with myself and I really appreciate their efforts in caring for their students no matter what. I am really grateful to be able to learn and excel with Layola. At the first time I thought that doing TOEFL test only needs a basic English skills, I tried the toefl trial test and I got lower than the score that I needed,which is 79. I was really concerned so I decided to join Ignatius Layola TOEFL Course which turns out to be a very great decision that I took to face this scary TOEFL test. I learned the strategy and rules in doing TOEFL test and this is really useful to get a score I needed. I'm abit regretful because I joined the course a bit late thats why I didnt take the full course package before I took the test. I got 103 in the test but I believe, if only I had take the full package of the course I might get way higher than that because each of every classes I took are very useful and important for sure. I knew Layola from my cousin, who previously took a Toefl course. I started taking Toefl course at Layola in March 2014. I really enjoyed learning at Layola because the learning atmosphere was really great, also the teachers are nice and friendly. Thank you Layola for all the support! Thank you to Mam Suryani and Ko Gunawan! Learning English at Layola is one of my favourite experience I've ever had. The flexibility of the time for the course, really helps me to reach the goal for my toefl test. The structure of the learning process is really good so I can keep it up and understand clearly what is being learnt. The staffs at layola is really friendly, patience and always available for us. I can say that the staffs are also caring but still strict so I can keep my self on track. The support both physically and mentally are given to me at all time at Layola. Besides the excellent human resource inside the courses the facilities both in jaksa agung and also Hr Muhammad are excellent. I have never encountered any problems while I was there. The atmosphere of the room is just right for studying so that's why I can study fully concentrate. One week before the test the teacher said that I'm ready for the test and in the end he is correct, I got 94 for the toefl test. Thank You Ignatius Layola for teaching me so I can reach my goal! Great Methods, Pleasant Lecturer, Motivating! I heard Ignatius Layola from my cousin, he says that it offer a good English course preparation for TOEFL test. I took one course to prepare myself for TOEFL test that I need to take. While I was there, not only they motivate me to improve my skill but also I learn a lot in term of my writing and speaking skills. Overall, I am satisfied with the course that it offer and they help me to mark a good score at the test as well that I just took this March, 2013. Studying at Layola has given me more opportunity to learn about English. What I really love about studying here is how the lessons are given by the teacher. It is easy to learnt and enjoyable because sometimes not only all about English lessons but importantly, life lessons are given too. I think I made a good choice by learning English here. I learnt so much just in a short time. At first, I don't know what is Layola. However after I found it, I feel like I just find my second family because Layola not only help my English, but Layola also help me in everything I need when I study overseas. Thank you Layola for helping me in everything and for being my second family. Layola has been very helpful in my English learning experience. 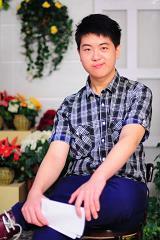 It offers not only English skills but also helps me with my choice of further education. Ignatius Layola is a great place to improve my English skills. It has been a great help for me to choose the university that fits me, pass the TOEFL® test and get into the university that I'm currently studying at. I am now studying at ERC because of Layola. Thank you so much, Ma'am Suryani and Ko Gun. After joining Layola, I got much better prepared in passing the TOEFL® test. I really enjoyed the course and thought it was a very worthwhile. I would like to say thank you for Layola that has really been supportive to me to study abroad. Moreover, Layola provided everything I needed to be registered and confirmed for the course I'm taking. Layola made it so easy for me to study abroad at a very good university in Singapore. Layola is one of the best English course I ever try. Layola has improved my understanding about English and how to apply English in my daily life as the foreign language. Layola also gives me motivation when I study there, so that makes me easily understand even when I face the TOEFL® test. I also get many friends when I study at Layola. Finally, Layola is best of the best English course I ever try. Dear Mam Suryani and Ko Gun, I feel very satisfied and thankful to both of you that made me can study in James Cook University without any problems, I don't know what I must say... I just can say thank you so much for your guidance, until now indeed. I can know and have many friends who study with me here so I don't need to worry if I have problems, because they will help me as well as they can. Thank you so much for everything. I'm glad to know both of you. Miss you Ma’am Suryani and Ko Gun. Layola helps me to find the right "path way" to get a better education. The tutor doesn’t only help me to pass the TOEFL® test, but also enable me to make a further educational plans. Layola has helped me a lot to get very high TOEFL® score. The teacher always intensively helps the students about the strategy for the test. The teacher teaches slowly but sure, Mam Suryani won't let us take the test if we aren't ready yet, I get 99 TOEFL® score and very grateful of that. Hello, my name is Elvina Goey. I really feel so blessed that I can be Ignatius Layola’s student. Surely, my English language was not really good at the first time, but at Layola, I can improve my English very well. When I had to take TOEFL® test for my university’s requirement, I went to Ignatius Layola course to study TOEFL®. I met teachers who really care and patiently teach me from zero to become a hero.